Sally Run: Fall is in the air . . .
After the trip of a lifetime to Paris and London, we are back at Sally Run and already back in school! Paris was magical, the Olympics and London were spectacular, but it sure feels good to wake up in our own beds, walk outside in our PJ's, and breathe that amazing mountain air. We were able to catch a lot of the action at the Olympics, but our favorites were tennis, track cycling, and dressage - mainly because the venues were unbelievable and with strong British contenders, the crowds were the most fun. The dressage events in particular were awe-inspiring. Our hats went off to Steffen Peters for what was likely Ravel's last trip down centerline. 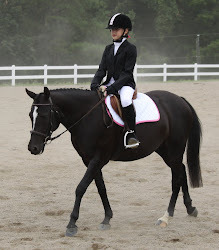 Ravel has been our top horse for so long, and US Dressage owes him so much for carrying our team for the past 5 years! So, as we head into fall, we are thinking about clinics again at the farm. Our next one with Lauren Sprieser is September 28th - 29th. Please email me (caroline@sallyrun.com) if you would like to ride and let me know which day. We hope everyone has had a wonderful summer - it always goes by too quickly - and we look forward to seeing you on the farm!! P.S. The pony B&B is open (hallelujah! ), so we have plenty of stabling for our guest equines! !